Honestly, it was just a matter of time before the sugar industry started coming back swinging. Folks like me have questioned their motives for decades, with some resulting (though woefully inadequate) government regulations. 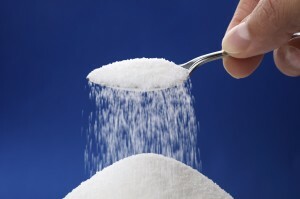 So it’s no surprise studies are starting to appear about the role of sugar in our diets. And not shockingly, some of those studies even open the door to interpreting that role as positive. Like this recent one, published in the Journal of Clinical Endocrinology and Metabolism just this year, in which a group of scientists tell us that sugar-sweetened drinks may actually reduce stress levels. In the study, researchers looked at 19 women, ages 18 to 40. Eight of those women drank aspartame-sweetened beverages and 11 drank sugar-sweetened beverages (once per day, at breakfast, lunch, and dinner, for 12 days). Before and after this study period, the participants underwent MRI screenings after taking math tests, to gauge stress response. At that time, their saliva was also analyzed for cortisol (a hormone that the adrenal glands release in response to stress). Those who drank the sugar-sweetened beverage showed a diminished cortisol response vs. the aspartame group, and they also showed more activity in the hippocampus, the part of the brain that controls memory and is affected by stress (in general, the less active the hippocampus is, the more stress the body is under). So it showed that sugar inhibited the stress response. The hippocampus activity showed that sugar may affect some physiologic pathway. This shows that sugar’s effect on stress may be more than psychological. And that is the 1-2 punch in terms of addiction — when you’re dealing with both a physiologic and a psychological component to the offending substance, it becomes even harder to quit. So, under stress more people get hooked on sugar and become possibly more vulnerable to obesity and all of its related conditions including diabetes and heart disease. The authors found that during times of stress around 80 percent of people report eating sweet or high-calorie food, and that this was the first evidence that sugar — but not aspartame — was actually effective in relieving stress in humans. Great. That’s all we need … someone telling the American public that sugar relieves stress. Oh, the excuses I can hear now! As you and I both know: eating lots of sugar certainly won’t help your stress levels in the long term and in fact, could make it worse, in addition to making you unhealthy! And then you’ll become stressed from that. If you’re feeling stressed, I’d much rather you dive into a decadent dinner of blue-cheese-encrusted filet…or even a piece of dark chocolate with berries and cream. Or even sit down with a martini or two. These are the types of indulgences you can enjoy that are actually good for you. Eating healthy doesn’t have to mean depriving yourself of delicious foods … and adding yet MORE stress to your life. It’s just a matter of getting used to a few simple substitutes … which will make kicking sugar to the curb one of the least stressful things you’ve ever done. Endocrine Society. “Difficult to break the soda habit? Sugar-sweetened beverages suppress body’s stress response.” ScienceDaily. ScienceDaily, 16 April 2015. <www.sciencedaily.com/releases/2015/04/150416132015.htm>.